NAAIM Speaks is bi-monthly newsletter containing market insights and analysis from NAAIM member firms. 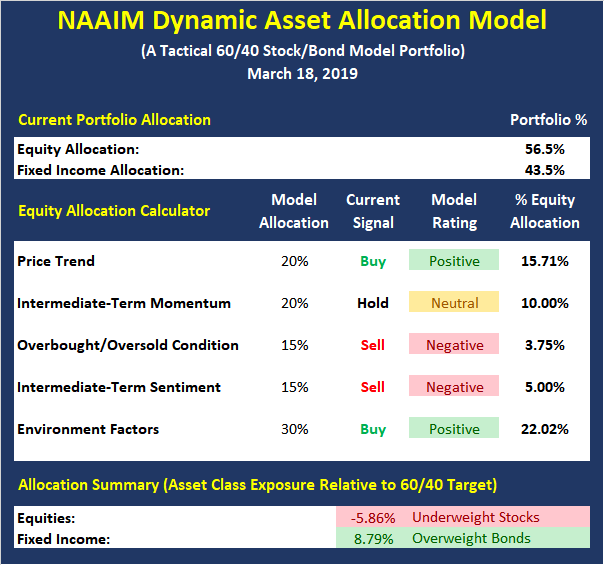 “Speaks” is designed to provide a plethora of market indicators, market analysis, some occasional humor, as well as a summary of NAAIM’s proprietary Dynamic Asset Allocation Model and Exposure Index. The report is for informational uses only and is not to be construed as investment advice. Are There Reasons To Be Concerned? Well it’s official. As of Friday’s close (a close that was likely influenced by the quad-witching event and a handful of S&P index rebalances), the S&P 500 is now up +20.05% from the 12/24/18 panic low. Wow talk about a joyride to the upside! Along with the market’s surge higher, which, for the record, has NOT experienced the typical “retest” phase, comes a healthy dose of “seller’s remorse” (you know, where anyone silly enough to think that December’s dance to the downside was anything more than a brief bout of “algos gone wild,” is now regretting their decision to manage the risk of the environment), S&P “envy” (be honest, how many advisors out there have taken calls recently about “keeping up with the S&P?”), and a little something called FOMO (fear of missing out). And from my seat, all of the above have combined to produce the relentless march higher. The headlines touted last week’s action (which at +2.9% was the best gain since November) as a resumption of the trend. A breakout. And a reason to celebrate! On Wednesday, the bulls tried to break stocks above what pundits are calling the “key” line in the sand. This was the fourth such attempt in the past three weeks. As I mentioned before the first try almost always fails and the second is usually a little more emotional. After that, one of the attempts usually sticks. You can see this on the accompanying chart. Today, is that fourth attempt and we will see where the bulls end up. 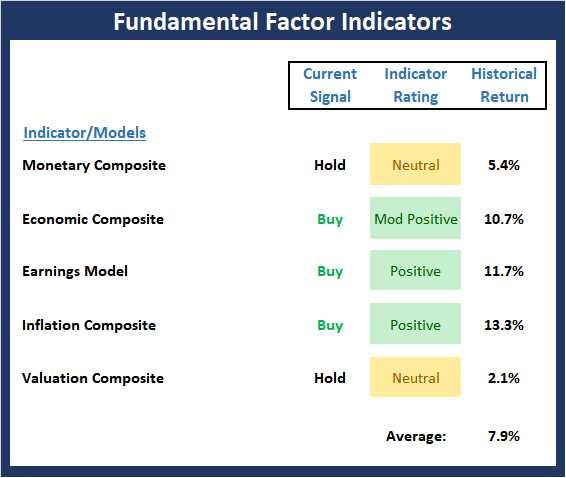 This week, we’re featuring the Fundamental Factors Board, which is a group of longer-term models designed to tell us the state of the big-picture market drivers including monetary conditions, the economy, inflation, and valuations. Our take is that all in, the Fundamental Factors board continues to suggest that the backdrop remains constructive. However, should the current “slippage” in the model readings continue or accelerate, we could see stocks begin to discount a further slowdown. But for now, the bulls have enough to justify a continued advance, albeit at a more modest pace. 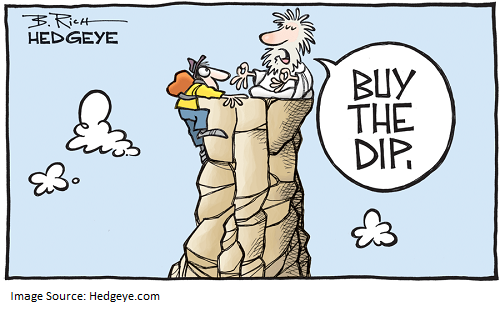 A New Course For The Fed? The calendar – light and including a lot of old news – invites publishers and pundits to emphasize fluff stories. The one event of substance is the FOMC meeting, announcement, and press conference. 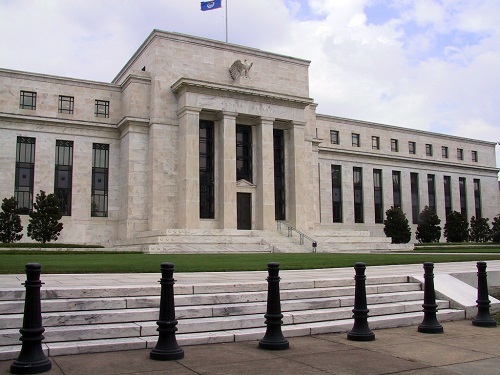 Fed watchers are hoping for more insight than they got on last week’s 60 minutes interview. Looking deeply into the statement and Chairman Powell’s explanations, pundits will be asking: Will the Fed signal – or even hint – at a possible change in course? My biggest criticism of the Fed is communication, even in the age of transparency. If they did something as simple as to hire a couple of interns to read financial blogs and watch Rick Santelli, they would have a better sense of market perceptions. 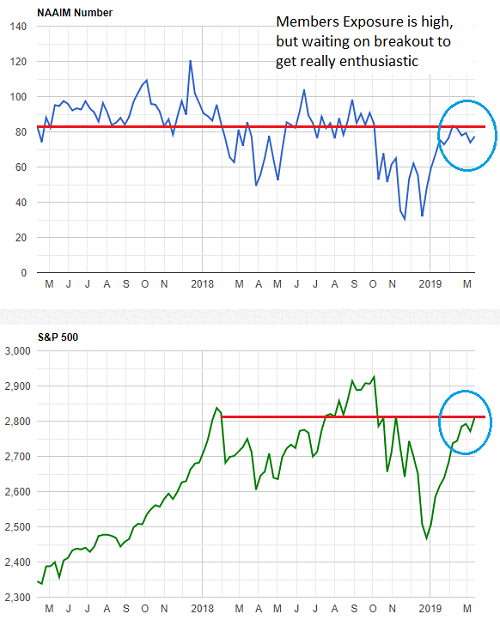 The strength of this market is undeniable and any hint of weakness has been met with buying interest from those investors that have missed out on the rally from the Christmas 2018 lows. Last week was the perfect set-up for some additional selling and profit-taking – and, yet, the market bounced back this week and is making another run at breaking through significant resistance at the October and November 2018 peaks. With each failed attempt, the resistance gains in importance. 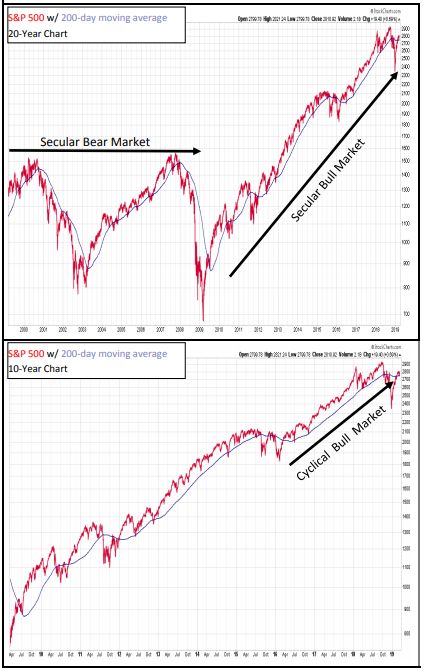 The most recent pullback now looks like it was nothing more than a ‘buying opportunity’ within an ongoing bull market. The NASDAQ was up 10 straight weeks in a row since the December low, so I was not surprised to see a down week 2-weeks ago. 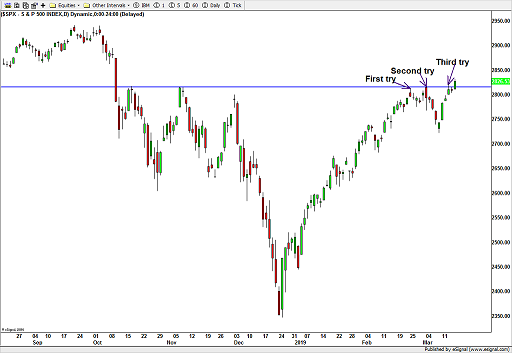 Last week was an up week for the NASDAQ Index and we could be back “off to the races,” again. 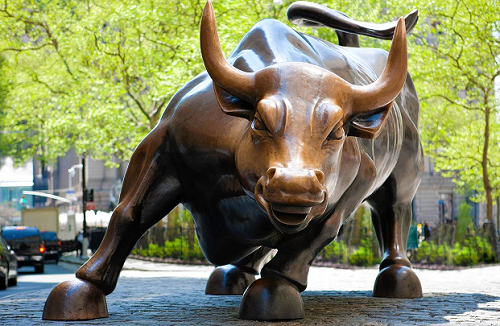 The market likes to climb a “wall of worry” but during a bull market the focus should be to “maintain long exposure” and avoid the temptation to “short” just because we are near all-time highs. The market appears to be in a “giving” mode so we will take what the market gives because one-day the market will not be so generous. I plan to take it one-day at a time and “let it ride” until the trend starts to bend in the end. We are just surfers riding the wave and our ability to make money is largely due to the size and extent of the wave, and not solely on our own magical abilities. We can control the risk we take, and the market determines the return we receive. My job is to keep it simple and try to stay on the right side of the trend because the “trend is your friend until the end”. The takeaway from this week’s Member Exposure reading is that member firms are fairly fully invested (~78% long) but appear to be waiting on a breakout before moving to fully invested exposure levels.